In my 27 years as a mathematics professor at Mt. San Antonio College (Mt. SAC), I’ve taught every math course typically offered at a community college, from basic skills through calculus. I’ve also taught every type of student you can imagine. Like the courses I teach, my students run the gamut — each requiring unique mathematical skills in order to succeed in college and life. One critical skill for all students, no matter their major, is inferential logic. Inference, often covered in elementary statistics and similar courses, prepares students to take on challenges beyond the math classroom. These courses strengthen their ability to go out into the world, make observations, and use evidence to demonstrate a point. This is general education – the kind of reasoning necessary for members of a healthy, vibrant society. Now, more than ever, we need to nurture our society and electorate to be able to think critically about data, facts, and information. That’s why I’m thrilled to see community colleges begin to allow students to demonstrate quantitative literacy (the requirement for general education math) through other math classes than just algebra. I’ve always felt we could better serve students by allowing them to focus more on statistics, and less on algebra. By offering math curricula that are more relevant to Humanities and Social Science majors, schools like mine are showing they see it too. College math curricula are traditionally designed to get students into calculus. This is great for STEM majors, but not for students with other interests. Community colleges need to prioritize adoption of alternative math pathways that better prepare students to think critically in the real world and eliminate roadblocks on their path toward a degree. Programs like Statway, the alternative math pathway we’ve adopted at Mt. SAC, are far more in line with real-world approaches to problem-solving and are designed to help more students thrive. Developed by the Carnegie Foundation for the Advancement of Teaching, Statway allows students to enroll directly into college-level statistics with necessary math remediation built in. Pathways like these give students the best chance of completing college-level coursework within a year, by taking courses that are relevant to the goals they want to achieve. Take Camel Lopez, a student of mine whose goal is to become a horticultural scientist and work for the FDA. He enrolled at Mt. SAC and got placed into lower-level math classes. After a while, he began questioning whether he’d ever make his way through to courses that would earn him college-level credit. That all changed when he enrolled in Statway and received the support he needed. He thrived off the group work and practical application, and I could see his confidence building as he dug deep into the material. He ultimately became one of my standout students, and I have no question that he’ll succeed in whatever goals he pursues. What motivates me as a teacher is my mission to help students like Camel, and to help as many of them succeed as possible. Neither the traditional math sequence nor traditional models of remediation are aligned with that goal and responsibility. Every year, more than 175,000 community college students begin their education in remedial math, and that’s in California alone. More than 110,000 of those students will never complete the math requirements and go on to earn their degree. These flawed remediation policies also exacerbate racial inequality in ways that, frankly, are unacceptable. Across California community colleges, Black and Hispanic students are disproportionately impacted by remediation policies. Students of color are more likely to be classified as “unprepared” and are often required to take three or more remedial math courses before they can even start earning credit in college-level math. Fewer than 1 in 10 of these students will complete the math requirements for a bachelor’s degree. These statistics are not acceptable to me, and that’s why alternative math pathways are so important. 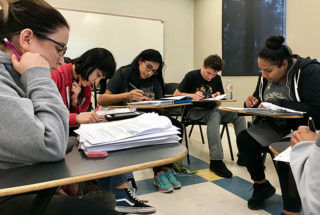 Statway students are completing college math at triple the rate of those in traditional remediation and doing it in half the time — across all ethnic groups. They go on to earn more college credits than students in remediation and transfer to four-year institutions at higher rates. Much of this success can be attributed to the immersive, collaborative nature of the course curriculum. The Statway curriculum is built around group work, where students have to work to discover things on their own. One of the fundamental truths of learning is that it’s a social activity. When students dig and struggle with the material, we see them actually learning — and they’re learning more. This is a strong departure from the traditional model, where a large majority of college-level math classes are taught in a lecture-only format where students are typically given steps to solve equations but are offered few opportunities to truly develop problem-solving skills. In such cases, where is the learning? Where is the cognitive development? After witnessing the success of Statway, it’s now hard for me to defend a system where classes are taught in such ineffective ways. Students have a right to enroll in rigorous, college-level courses where they can be successful and be provided meaningful learning opportunities for their college, career, and life goals. Our responsibility is to ensure that math policies and curriculum do not make capable students less likely to accomplish their dreams. Scott Guth is a mathematics professor at Mt. San Antonio College outside Los Angeles.